At Walgreens Centralized Services, we rely on our team of call center/work from home Pharmacists, Pharmacy Technicians and Customer Care Specialists to support our customers and retail partners across the United States. This allows our in-store Pharmacy teams to spend more time focusing on the communities we serve. Every day brings a new evolution, as we constantly push the boundaries of what's possible. Our Digital team members are at the forefront of a rapidly-evolving industry, surrounded by equally forward-thinking individuals. Your efforts help us drive our business strategy and ultimately help improve the lives of our patients and customers. Walgreens is innovating the customer experience, where the customer can choose any path across channels, both to do research, and to make a purchase decision. We believe that our digital and in-store experience makes us the most convenient multichannel retailer in America for health and beauty needs. We believe that the future of retail and healthcare is an intelligent blend of great experiences designed with the customer at the center using the fastest and most efficient engineering solutions that offer the best services and products. Walgreens is also building on other Internet-focused strategies, including text message marketing, web TV content and social media connections. At the same time, we are increasing the number of our products that we sell exclusively on the web – which already totals 30 percent of our entire product selection – and the number of delivery options we offer, including store pickup of web orders. We’re also the first pharmacy to provide PatientsLikeMe reports about medications on its website. PatientsLikeMe is a free network where anyone living with a chronic condition can track and share symptom and treatment experiences, connect with others and contribute data for research. The website has helped more than 400,000 people learn from each other about how to improve outcomes. With measured expansion goals both for our stores and our other health and beauty businesses, our team members in Facilities and Real Estate are crucial to furthering our physical presence, as well as the scope of our business. Watching Walgreens become an integral part of a community, while building market share and name recognition, is a rewarding experience where you help put our company on the map – literally. It’s a great feeling to see a new Walgreens in the community and know that you helped make it possible. Join a dynamic, collaborative Finance and Accounting team that helps to shape and maximize our company performance. This goes well beyond reporting the numbers and includes deep knowledge of finance and accounting practices, rules and regulations as well as cross functionally driving the financial health of a multi-billion dollar organization and helping to uphold Walgreens high ethical standards and business practices. Ultimately, the work we do helps keep the company financially sound to help improve the lives of our customers, our team members and our shareholders. Functions within our department include Accounting, Controllership, Financial Planning & Analysis, Shared Services, Business Unit Finance Support, Internal Audit, Corporate Tax, and Results. Our team members come to us from a variety of different roles in order to make a vital impact to the financial well-being of the organization from the checks and balances that our senior financial analysts complete, to the financial investment models and high level reporting that our team facilitates. Come join our team and learn about the retail and healthcare industries! Additionally, our Accounting & Finance Development Programs are perfect for entry level talent interested in starting their career in accounting & finance! To learn more, click here. Join one of our teams in Global Insights, Global Consumer Brands or Sourcing and Supply. WBA Global Brands is a cross-divisional function of Walgreens Boots Alliance. Here, our experts focus on bringing products and brands to life across the world. We have a number of opportunities across our three core teams, from Global Insights to Global Consumer Brands to Global Sourcing and Supply. Whether you’re a data analyst, a financial coordinator, product manager or a logistics and operations executive, we’ve got roles to suit every career path. Here, we care about ideas and, most of all, our customers and consumers – our aim is to help them live happier and healthier lives. 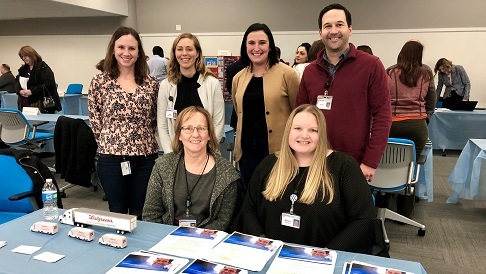 Our Human Resources and Legal departments work to support every aspect of the Walgreens career experience and are vital to our success as an organization. As an HR professional, you’ll impact everything from talent development and recruitment to benefits and performance management. Whether you’re interested in designing training programs, creating and implementing salary programs or helping us find our next talented team members, you’ll truly see the value Walgreens places on our HR team members. Walgreens has something for everyone who wants to build a successful career. Anywhere you go, you’ll find supportive co-workers, a positive environment and the tools you need to pursue your interests, grow your skills and advance your career. Interns experience life at Walgreens in a hands-on environment like no other. We encourage students to provide fresh ideas and a different outlook. That’s why our 10-week internships make you part of the action from the first day. And that’s why we include challenging business projects that drive department goals and objectives as part of the experience. Our goal is to help you hone your skills at one of the best-known names in healthcare and retail. You’ll have mentors, attend valuable information sessions, and visit one of our state-of-the-art distribution centers as well as a signature Walgreens flagship retail store location! Not to mention, you’ll have a lot of fun, with frequent social events to allow you to network and learn from team members and fellow interns across a variety of divisions. Our corporate internship program will not only give you a window into working at Walgreens, but also the kind of real-world knowledge that you can take with you wherever you go. Our Legal functions span a wide range of specialties, safeguarding the present and future of our organization and its mission. You can be a part of our extraordinary team in three distinct areas. Our Law Department manages everything from real estate transactions to financing to litigation. Our Corporate and Regulatory Law team handles federal, state and local matters involving governmental agencies, state boards and departments. Government and Community Relations manages federal and state legislative relations and corporate charitable donations. The departments within Marketing work in unison to engage customers and Walgreens team members alike with energy, new ideas and innovation. It’s everything from our Balance Rewards loyalty program, television ads, weekly circulars, and in-store advertising displays to consumer behavior research and supporting our owned brands – both in-store and online. You’ll be an integral part of our purpose to champion the health and well-being of every community in America, as well as making sure our products, programs and company image remain fresh, appealing, and top of mind to consumers everywhere. Our expert omni-channel merchants partner with our global insights teams to ensure the right mix of products for Walgreens customers – when and where our customers need them. We partner with diverse suppliers and use our in-depth understanding of our unique customer needs to spot trends before they hit mainstream. Each day, we champion the health and well-being of every community in America, ensuring that Walgreens customers have access to the products they need to make their lives better. Whether it’s through our consumables, seasonal and gifting products, health and wellness products or beauty and personal care assortments you will decide the perfect product mix for our customers. Our Merchandising Analyst Rotational Program is designed to develop well-rounded, high performing merchandising leaders with the ability and acquired insight to eventually be the future leaders of Walgreens Merchandising business. To learn more, click here. Join a dynamic, cutting edge, collaborative and growing team where you will be able to shape and lead multi-million dollar categories. We are challenging the status quo and driving “Best Practice” solutions, strategic change and building a reputation within the industry for best-in-class thinking and delivering business results. Every day is different and provides an opportunity to offer up creativity and innovative thinking to your internal clients and external partners. As a team member of the Walgreens Compliance Office, you’ll work with management in nurturing a culture in which every Walgreens team member behaves ethically and in compliance with applicable laws, regulations, and company policies. You’ll be a compliance resource for all team members and managers by providing compliance policies, procedures, and tools for preventing, detecting, and responding to illegal or unethical business practices or conduct. You’ll have the opportunity to safeguard the organization against key compliance and legal risks through the management of a standardized, enterprise-wide compliance process. In the end, your efforts will support the overall goal of the Compliance Office to ensure that Walgreens continues to be recognized as an innovative, ethical, and trustworthy company — grounded in honesty, ownership, empowerment, good judgment, and personal accountability. From Call Centers to Asset Protection to Administration roles, the individuals in Operations and Support provide the backbone of our company. You’ll be valued members of this supportive organization, and you’ll benefit from growth and learning opportunities that will help you enjoy new levels of professional success. If you’re ready to help build our business, we’ll help you build a fulfilling career. Our Call Center Operations team is vital to our organization as they serve the voice of our company. We know that our reputation and success are highly dependent on the customer care and patient support we are able to provide every day. That’s why as a member of the Customer operations team, you will be encouraged to think creatively and seek innovative solutions and resolutions on behalf of our customers and patients. Well-versed in a variety of areas and subject matter, from product issues to pharmacy to how to access our Balance Rewards loyalty account, you’ll help keep our customers loyal and coming back in a rewarding, fast-paced environment where caring people and careers rule the day, every day. For more information about opportunities in our Call Center Operations group, click here. Our sales team offers up-to-date healthcare and wellness expertise and industry knowledge to external client accounts. They develop, sell, manage and report on our company’s expanding wellness products and services. Their mission is to partner with our clients to effectively support and nurture these programs and to ensure high-quality patient care and satisfaction. Ultimately, we hope to reduce overall healthcare costs and profitably grow our business. The Market Access Sales and Account Team has responsibility for managing relationships with the top payers within the US, Puerto Rico, Hawaii and Alaska. This team is charged with representing Walgreen’s suite of products and services across our customer’s entire enterprise, including all national and regional health plans, PBM’s, Government agencies, large employers and consultants. You’ll proactively guide the company’s growth – from profits to market share – by providing unbiased, market-centric strategic direction for our initiatives. And these efforts will drive innovative products and services to market, increasing sales and profitability. Participation within our strategy division calls for everyone from our Real Estate Managers to our Mergers and Acquisitions team to interact across numerous departments and levels, including top executives. Our innovative supply chain model sets the industry standard, and it enables our company to increase sales while keeping inventories low. You’ll provide the strategy and the momentum that moves products through the pipeline from our suppliers to our distribution centers and then to our stores. It’s an opportunity to be at the forefront of your profession and to help us continue to revolutionize both our methods and the industry.